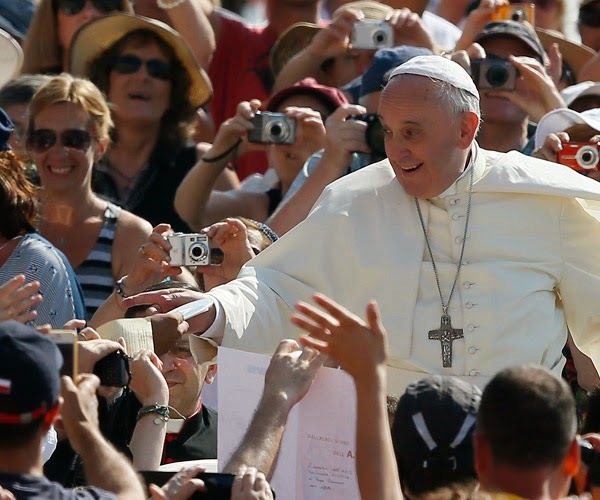 Beggars All: Reformation And Apologetics: Pope Francis Says, " Don't proselytize; respect others' beliefs"
Pope Francis Says, " Don't proselytize; respect others' beliefs"
Don't proselytize; respect others' beliefs. "We can inspire others through witness so that one grows together in communicating. But the worst thing of all is religious proselytism, which paralyzes: 'I am talking with you in order to persuade you,' No. Each person dialogues, starting with his and her own identity. The church grows by attraction, not proselytizing." I really like this Pope! Hello Mr. Swan, I like Pope Francis too! Of course, he is quoting Pope Emeritus Benedict XVI who said the same thing in Deus Caritas Est, but is saying it in a pastoral manner as opposed to scholarly way. Christians are supposed to evangelize through their witness in words and deeds. As apologists, we are good at evangelizing in words, but it is our actions that convert hearts. That is the whole point of Gospel story of Our Lord on the road to Emmaus. That is supposed to be the reason why Catholics venerate saints~so we model our lives after Mary and the saints. We Catholics do tend to forget the truth in the hurly burly of apologetic endeavers that Protestantism has brought much improvement to the Church. Without the Reformation, there would not have been a Counter Reformation. Without the shared witness of Catholic and Proestant ministers in the concentration camps, we would not have had a Vatican II which recognizes that Protestant churches are true vehicles of grace through which God works in our lives. Loving God and neighbor is not the exclusive province of Catholics or Protestants. The famous canon lawyer Fr. Gregory Hesse (who rejects Vatican II) said explicitly in his lectures that JPII is "definitely a heretic". If Fr. Hesse was alive today, I wonder what he would think of this Pope's "heresies", which are already far worse than JPII's. Worse, this Pope has infallibly canonized JPII the Great. Hello explorer: As a faithful Catholic who follows the teaching of the Magisterial Church, I will only state that if Fr. Hesse denies the teachings of Vatican II, then he is in error. The recognition that Protestants are part of the Church and the Body of Christ is not an innovation of Vatican II but can be found in the Catechism of the Council of Trent which recognized the validity of Protestant baptisms so long as it was conducted in the correct form with water and the words "in the name of the Father and the Son and the Holy Spirit. See also Council of Trent, Session VII, Canon 4 on Baptism. Pope Leo XIII says this as well in Apostolicae Curae. Not only that, St. Augustine rejected the heresy that Fr. Hesse apparently espouses when he confronted the Donatists. Simply put, if a person is baptized using water and the Trinitarian formula, they are as Catholicas you and I am. They may espouse heretical views, but it sounds like you do as well if you are going to reference Fr. Hesse. I will not judge whether you are outside of the Church, no more than I do anyone else who professes to believe in Jesus Christ, Our Lord and Savior. As Catholics we have an obligation to set forth correctly what the Church teaches. Our faith is not a cafeteria faith where we get to pick and choose what we want to believe. I suggest that you actually spend the time reading Lumen Gentium 15 and the citations (ALL pre-Vatican II) that are referenced. We do not have the right to judge the sincerety of the hearts of those who hear what the Church teaches and reject it. We can only hope and pray that they accept the truth that the Catholic Church offers and use the grace that Our great God chooses to offer each of us and continue to evangelize to them out of love. St. Francis de Sales, no slouch when it came to disputing with Protestant doctrine where it could not be reconciled with the teaching of the Church, said, “Whoever preaches with love, preaches sufficiently against the heretics, even though he utters not a word of dispute against them.” Why do you want to reference a heretical priest that sounds more like a Jack Chick than a St. Francis de Sales? Hi Jim your blog is fascinating and I see you have devoted a great amount time to debunking or corroborating the life and words of Luther. I think this is a good thing considering the fact that most of today's Evangelical Protestants know little to nothing about the great reformer and the papists have demonized him for questioning the powers that be and where in the gruesome and sordid past of the "vicars of Christ on earth". 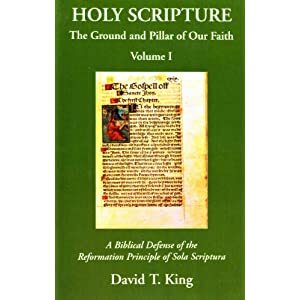 Is it true that Martin Luther said that "Justification by grace alone through faith alone in Christ alone is the pillar on which the Church stands or falls."? My personal reading of the Scriptures would certainly support that conclusion. I don't read about a "treasury of merit" or such things as "purgatory" and certainly blessed as Mary was to be the vessel through which Christ was to born, she is nowhere in Scripture to be divine in any manner. Christ called her "woman" on the cross. I can continue with many things that papists seem to believe that just seem unbiblical and therefore repugnant. Their apologists have much sophistication and even logical arguments but with all that they seem to have devolved into another religion then the Bible teaches. As a Christian, who trusts only in God's inspired word, I cannot, in good conscience, call a devout papist brother. As far as "don't proselytize" (Mt. 28:18-20) the law of non-contradiction is violated here if one believes the words of Christ. I tolerate other's beliefs but I certainly cannot respect them because they're false. Thanks for being a light in the darkness brother. Scott: Thanks for your comments and support!